The Jazz Reporting Service is the new reporting solution from IBM Rational Software developed on top of the Jazz integration platform and is intended to support the authoring of custom reports for the Collaborative Lifecycle Management (CLM) solution. 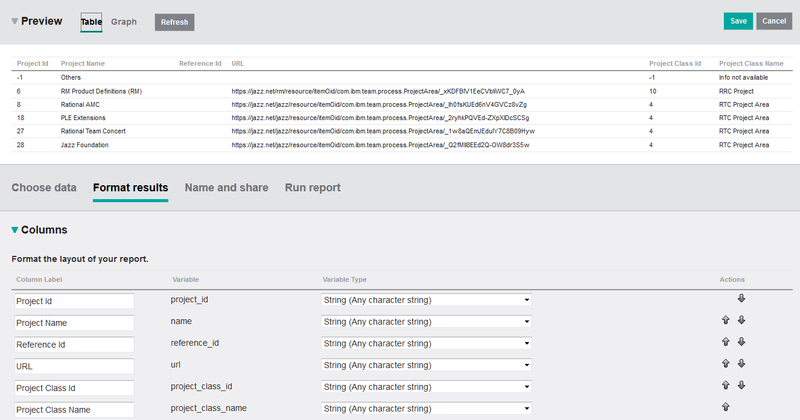 A previous articles around Jazz Reporting Service covered reporting using the build in query builder [Haumer 2014], which allows end users to create their own reports almost right away with simple drag-and-drop gestures and selections. Another article [Shaw 2014] went one step further and demonstrated how to use the Structured Query Language (SQL) editor to modify and refine the underlying SQL statement that were generated by the query builder introducing some more advanced features. Data Warehouse tables and attributes representing CLM entities, by defining a pie chart report that shows the number of project areas according to their class, i.e. whether the project is a Requirement Management project, a Quality Management project or a Change and Configuration Management project. This reporting exercise will use a table that is not available using the Jazz Reporting Service query builder. Lookup tables defining traceability links, by defining a pie chart showing the percentage of requirements that are covered by test cases and those that are not. This report will also show you how to use SQL expressions to define derived attributes. Custom CLM attributes, by defining a refinement of the above report in the form of a bar chart that also renders the business priority of the requirement. Complex traceability reports using nested SQL statements, by defining a traceability report that takes it origin in requirement collections, follows traceability to the linked test plans, and then for each test plan shows whether the test cases of the test plan covers the involved requirements or not. 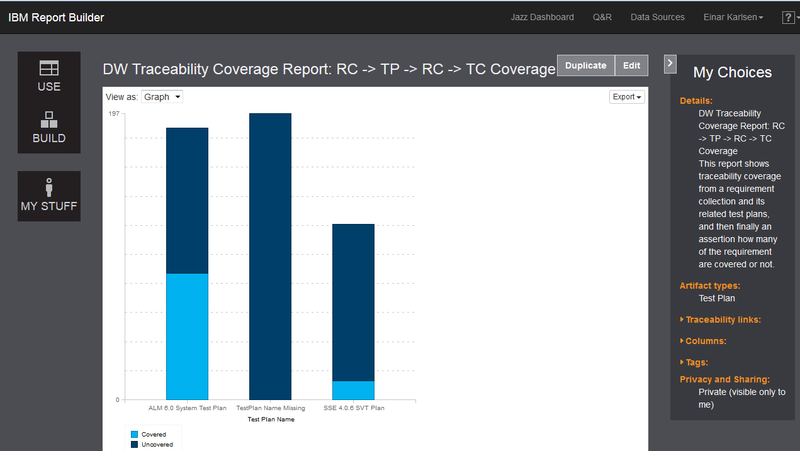 All four reports are status reports and can be implemented using Jazz Reporting Service as it comes with version 5.0.2 of the IBM Rational Collaborative Lifecycle Management solution. The reports are – by the way – listed according to increasing level of complexity, so we will start out with the simple case first and then end up with something significantly more complex at the end. In the following I will assume that you are familiar with relational databases and SQL in general. It will moreover be taken as a prerequisite that you have read the publications of Haumer and Shaw that shows how Jazz Reporting Service can be used to define simple and more advanced reports, and that you have some hands-on experience using the query builder. Before we go into details regarding the reports, lets have a close look at the architecture of Jazz Reporting Service. 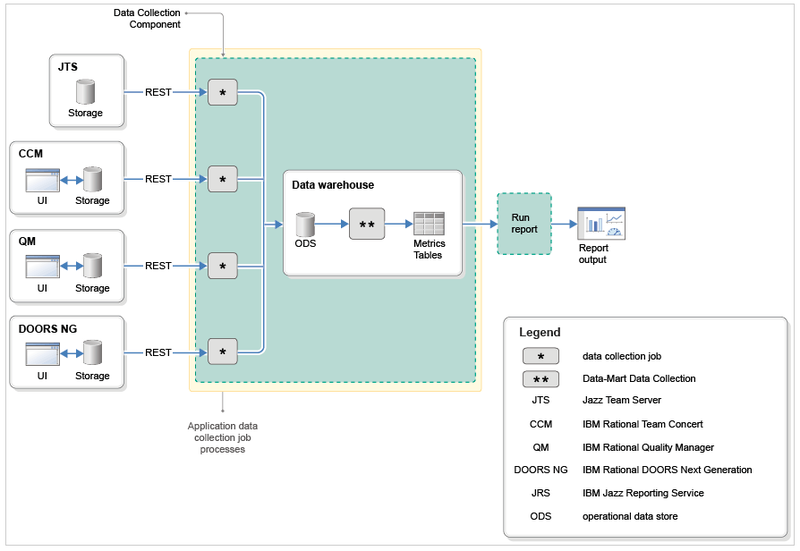 The detailed architecture of Jazz Reporting Service has been documented in the IBM Knowledge Center (see Figure 1). Jazz Reporting Service get information from the Jazz Team Server (abbreviated JTS in the figure), IBM Rational Team Concert (CCM), IBM Rational Quality Manager (QM) and IBM Rational DOORS Next Generation (DOORS NG). The information is retrieved by the so-called Data Collection Components which serves as Extract-Transform-Load (ETL) jobs in this architecture. The information is loaded into the Operational Data Store (ODS) part of the the Data Warehouse first, and having passed this phase, other data collection jobs are responsible for filling the metric tables with data for trend reporting. RIODS (originally an abbreviation for Rational Insight Operational Data Store) that consist of highly normalized database tables containing information regarding the various CLM artefact’s such as projects, work items, requirements and test artefact’s – including their attributes and relationships. RICALM (Rational Insight Collaborative Application Lifecycle Management) that contains information related to custom CLM attributes as well as history tables for reporting on artifact changes, such as changes to the requirements, work items and test cases (amongst others). RIDW (originally an abbreviation for Rational Insight Data Warehouse) that contains information for the various data marts to support trend reporting. Basically this boils down to star schema’s being defined in terms of fact tables storing the metrics as well as the dimension tables representing the dimensions of the star schema. The RIDW contains – in extend – a set of de-normalized views over the ODS tables, which come in handy for reporting purposes. The ODS basically provides a partial snapshot of the information in the CLM tools reflecting the state of affairs at the time where the data collection jobs were last run. The tables have a common structure and have been defined according to the same set of patterns. We shall look into this topic in the next section. In this first report over the Data Warehouse we are interested in a pie chart showing the number of project areas according to their class (see Figure 2), i.e.the number of Rational Team Concert (RTC), Rational Quality Manager (RQM) and Rational Requirements Composer/Rational DOORS Next Generation projects (RRC). Understanding the underlying relevant data model of the Data Warehouse, i.e. where can you find the relevant data needed for the report. Creating the relevant SQL statement. Formatting the report so that it renders the data according to the reporting requirements. Lets start with the Data Warehouse first. What we need is a list of projects in the Data Warehouse together with some basic properties such as project name, project URL and of course the project class. There are two schema’s that contain such information in the Data Warehouse: the schema named RIODS and the schema named RIDW (See Figure 3). The advantage of using the schema RIDW as a basis for reporting rather than the schema RIODS is that the former offers a joined view (RIDW.VW_PROJECT) containing information from the table ODS.PROJECT as well as other tables such as RIODS.PROJECT_CLASSIFICATION (see Figure 3 for more details). Notice that view names are prefixed with VW_. Validating the report will tell you whether the query is well-formed or not. However, it will not give you an idea whether the SQL statement has the right semantics – i.e. whether it returns the correct set of data or not. To test that the SQL statement is correct I usually render it as a Table first before I start changing the format to Graph. It therefore makes sense to complete the report definition and define proper labels for the columns. Then preview the report e.g. 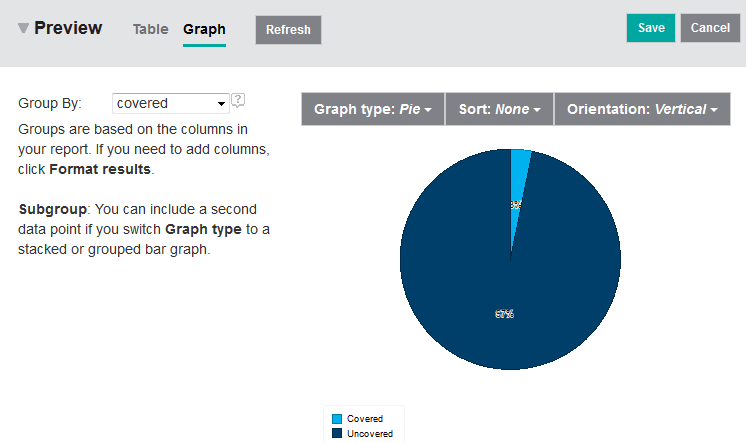 by clicking the Refresh button to check if the query returns the correct result (see Figure 5). Or even better – run the report to get the complete set of data returned by the SQL statement. Having checked that the SQL statement returns the correct data you must change the layout of the report from Table to Graph, select Pie as graph type and select the Project Class Name as the column to Group By (see Figure 2). The simple query exposes some patterns that are found throughout the entire Data Warehouse. Many tables in the Data Warehouse are defined with a number of standard columns – some of which can be observed in the query that we have just defined (see Table 1 for a more complete list). For example, every PROJECT in the Data Warehouse has a unique internal identifier (PROJECT_ID). If you look at the first row of the results returned in Figure 5 you will observe that the first row has PROJECT_ID equal to -1. Many tables in the Data Warehouse got a predefined row with key -1. This value is used in foreign keys to designate the NULL pointer so to say, i.e. a PROJECT_CLASS_ID of -1 is used in a project that got no associated project class, a PROJECT_ID of -1 would be used to describe an entity that does not belong to a project. The corresponding name for such an entity is frequently the string “Info not available” – or in case of project simply the string “Others”. Moreover, please observe that a row is never physically deleted in the Data Warehouse, rather the value of ISSOFTDELETED is changed from 0 to 1 when deletion in the source has occurred. In the Data Warehouse you will observe that there are other common columns used in many tables such as SOURCE_ID, EXTERNAL_KEY1, EXTERNAL_KEY2 and REC_DATETIME. These columns uniquely identify the entity upon re-import by the Data Collection jobs, and also gives information about the last import date. Unique internal key of type INTEGER which is automatically generated by the Data Collection Component when the corresponding row is inserted into a table the first time. The foreign key that designates a specific entity in another table, in this case the table PROJECT_CLASS. Contains the name of the entity, i.e.. the name of the project area or for work items the Summary. Contains the identifier of the entity visible to the user. For work items it would be the integer number uniquely denoting the work item in a project area. The (Jazz) Uniform Resource Locater (URL) of the designated entity. An external (INTEGER) key for the entity, i.e. for work items the work item number. An external key in the form of a STRING. Identification of the source of the entity, i.e. the project area. An INTEGER that defines whether the entity is soft deleted (1) or not (0). Notice that bulk text such as descriptions and larger formatted text fields are not present in the Data Warehouse. In order to report on such information you will need to use e.g. the IBM Rational Publishing Engine for reporting using the Representational State Transfer (REST) services of the development tools. In this example we shall create a report that shows the test coverage of requirements , i.e. whether a requirement is covered by a test case or not. The preview of the report is shown in Figure 6. As in the previous example there are 3 basic steps involved in creating the report: 1) understanding the underlying relevant data model of the Data Warehouse, 2) creating the required SQL statements and 3) formatting the report so that it renders the data as wished. For what concerns the first topic – the Data Warehouse tables or views to be precise – the information is stored in 2 relevant views in this case. A view RIDW.VW_REQUIREMENT gives information about the requirements whereas another view named RIDW.VW_REQUIREMENT_TESTCASE_LOOKUP defines a binary relationship defining the association of requirements to test cases. In other words, the so-called lookup table stores information related to the CLM “Validated By” links. Figure 8 gives an overview of the data model. You will find these lookup tables in many places in the Data Warehouse and they are used to define trace information due to e.g. OSLC links such as a trace from a requirement to a test case. Some of the lookup tables are also used to define the association between collections and their contained element, such as VW_REQUICOL_REQUIREMENT_LOOKUP that defines the relationships between requirement collections on the one hand and the contained requirements on the other. However you may also find tables in the Data Warehouse that have the suffix _HIERARCHY such as VW_REQUIREMENT_HIERARCHY. These tables are intended to present links between parent objects and child objects, e.g. from a parent requirement to a child requirement. They are similar in structure to the LOOKUP tables. The SQL statement takes its origin in the view VW_REQUIREMENT, and joins it with the view VW_REQUIREMENT_TESTCASE_LOOKUP to get the associated requirements and linked test cases. Notice that the join is an outer join meaning that it will still return a result row for a requirement even if the requirement has no matching test case. This is actually a minimal example in using lookup tables. All you would need to do now would be to paste this SQL statement into the report as the underlying query for the report, validate it and then re-order and rename the resulting columns. Notice that the output delivered by the query is kept to a minimum as well: it consists of just the requirement identifier followed by a computed column delivering an indication whether the requirement is covered by a test case or not. By the way: in defining such queries I prefer working with internal Data Warehouse identifiers rather than REFERENCE_IDs since I know that the internal identifiers such as REQUIREMENT_ID are a) filled with data and b) unique. REFERENCE_IDs do not necessarily exhibit those properties. The REFERENCE_ID for a requirement for example is the requirement integer number as it is visible to the user in the user interface of IBM Rational DOORS Next Generation (e.g. 60). A requirement in another project area may of course have the same reference identifier. The internal identifiers are in contrast unique. The first requirement to be imported into the Data Warehouse will get REQUIREMENT_ID equal to 0, the next to 1 – so forth and so on. The final step is to choose report layout. 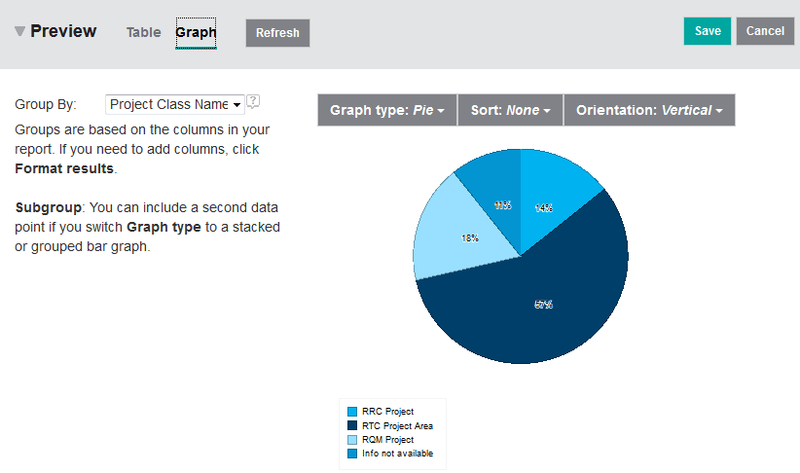 You should start by selecting Pie for the Graph type. Then set the Group By option to covered as shown in Figure 6. Suppose that we would like to refine the report just defined so that it shows test coverage discriminating over some kind of custom requirement attribute like for example “Business Priority”. This will require the use of a stacked bar chart as shown in Figure 9. Information regarding the custom CLM attributes are kept in the CALM schema of the Data Warehouse. As for the projects there are two kind of definitions: base normalized tables and views (that are more convenient for reporting). I shall focus on the views only. One example is the view RICALM.VW_RQRMENT_INT_EXT (standing for requirement integer extension) which, for enumeration attributes, stores a triple consisting of the internal REQUIREMENT_ID, custom attribute NAME and the integer value of the enumeration literal (VAL). 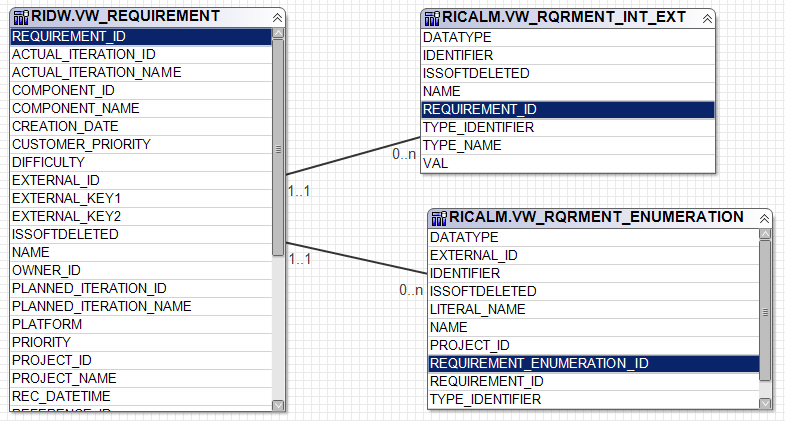 Another relevant view is RICALM.VW_RQRMENT_ENUMERATION which provides the triple REQUIREMENT_ID, NAME, LITERAL_NAME which is exactly what is needed for reporting purposes over custom enumeration attributes. There are similar extension tables for booleans (BOOL), decimals (DECIMAL), strings (STRING) and dates (DATE). You can get to the basis of that report simply by using the query builder. Select requirement as the object in scope for the report, followed by the relevant attributes – including the custom attribute needed for the report (e.g. “Requirement Priority” or “Requirement Business Priority” say). Then define a trace to the test case as in the previous report. So far I have shown you reports with increasing level of complexity and at the same time introduced the key concepts of the underlying Data Warehouse one by one. I would like to end with a real life example coming from a system client. System clients are very much into traceability, and the report that the client requested was basically a report that should take its basis in requirement collections following traces to the relevant test plans, and then show the requirement coverage for each test plan. An example of the underlying list report can bee seen in Figure 11. The query uses two lookup tables: TESTPLAN_TESTCASE_LOOKUP to determine the relationship between test plans and its constituent test cases and the lookup table VW_REQUIREMENT_TESTCASE_LOOKUP that defines the links between requirements and test cases (and vice versa). The two views are joined together by comparing TESTCASE_IDs using an outer left join which means that it will also show the test cases for which there is no associated requirement at all. Following this exercise in defining complex SQL statements it is actually quite easy to perform a last step in order to render the information as a set of stacked bars showing the coverage of the requirements for each individual test plan involved. In this article I have shown you how to define more advanced reports over the Data Warehouse using SQL statements as a basis rather than the query builder – except in a few cases where the query builder can indeed be used to generate small fragments of the solution. At the same time – and this is almost more important – I have taken the opportunity to provide an overview of the Data Warehouse – its schema’s, tables, views, naming conventions and solution patterns. In order to get more familiar with the Data Warehouse I can only recommend to connect to the Data Warehouse using a local installation and then browse the catalog. A very helpful dictionary is furthermore available on the IBM Rational Knowledge center [IBM 2015]. The current article has a strong focus on reporting over the current state of affairs. A second article will appear later in 2015 showing how to use Jazz Reporting Service to define custom trend reports using SQL and history tables as well as the star schema’s available in the Data Warehouse. However, this will require use of v6 of CLM. [Bater 2014] Robin Bater: Rational Reporting Made Simple: Using Out of the Box Reports, https://www.youtube.com/watch?v=DnCxavfFcLg, 2014. [Haumer 2014] Peter Haumer: Discover cross-project reporting with the IBM Jazz Reporting Service, IBM Rational Software, https://jazz.net/library/article/1417, 2014. [IBM 2014] IBM Rational User Education Service: IBM Rational Jazz Reporting Service, https://www.youtube.com/playlist?list=PLZGO0qYNSD4WC3zD9bQuejVSVofVLE9nq, 2014. [Shaw2014] Steven Shaw: Advanced Report Creation in Jazz Reporting Service 5.0.2, IBM Rational Software, https://jazz.net/library/article/1470, 2014. Dr. Einar Karlsen has been with Rational Software since 1998 supporting clients in the adoption of tools and methods for Requirement, Architecture and Test Management and is currently working as Solution Architect for Application Lifecycle Management solutions within the IBM Rational organization. He is currently Technical Lead for reporting within the IBM Rational organization in Germany. Was this information helpful? Yes No 9 people rated this as helpful.